Casey and James Dotzler with daughter Sophie. A couple from central Iowa become parents of quadruplets Wednesday. 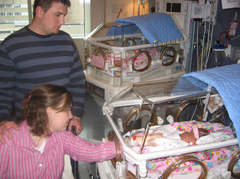 The babies are the first set of quadruplets born at Mercy Medical Center in Des Moines since 1999. More babies are delivered at Mercy than any hospital in the state. Casey and James Dotzler of Bondurant say Emme , Sophie, Brady and Max are doing well, despite being nearly 10 weeks premature. The babies arrived just after 10 a.m., weighing between 2 pounds, 10 ounces and 3 pounds, 7 ounces. The boys are getting extra breathing help from ventilators. The Dotzlers learned they would be having quadruplets in June. “Although it was stressful at first to find out you’re having four babies, because you don’t know what the outcome is going to be, we just always trusted that God wouldn’t give us more than we could handle and we just feel very blessed,” Casey said. Casey and James are 26 and 28, respectively, and grew up in northern Iowa. Casey is from Clear Lake, James is from Rockwell. After learning they would become parents to four babies at once, they met with another Iowa woman who had quadruplets 12 years ago. The couple says the best advice they received was not to worry too much about keeping their house perfectly clean. “She said, when the babies are down, try to get some sleep yourself,” James said. The babies will likely remain hospitalized through mid-to-late January. Casey and James say they both plan to eventually return to their jobs. Casey is a Head Start teacher in Des Moines, while James works for the Polk County Conservation Board. They admit it won’t be easy, financially, adding four babies to their household. “We don’t, obviously, have huge incomes being a teacher and a park ranger, so we’re just going to make the best of it and do the best that we can,” Casey said. Prior to Wednesday’s C-section delivery, Casey spent 10 weeks on bed rest. She says she spent a lot of that time worrying about having healthy babies. “Once I saw them, I just kind of forgot I was even on bed rest,” Casey said. “The most amazing thing, I think, was hearing them cry,” James said. “It was just such a joy. All the emotions that had been built up for 30 weeks just came out and it was just amazing.” Today is the 12th birthday for the McCoy septuplets of Carlisle. The grandparents of the Dotzler quadruplets are Jerry and Jean Dotzler of Rockwell and Kevin, Melonie (stepmom of Casey) and Robin Nye of Clear Lake.